Signal is one of the best mass texting services for your ministry. It’s free for up to 500 subscribers and for you to send up to 1,000 text messages a month. If you follow the tips on improving student communication using mass texting services you’ll stay well within those limits (unless your campus ministry is huge). 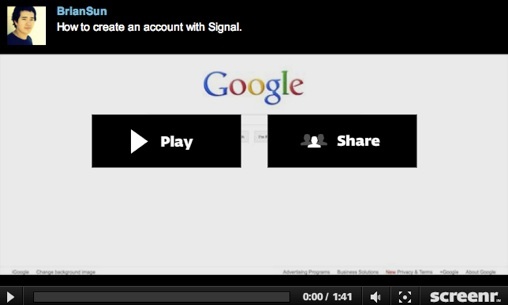 How To Create An Account In Signal. 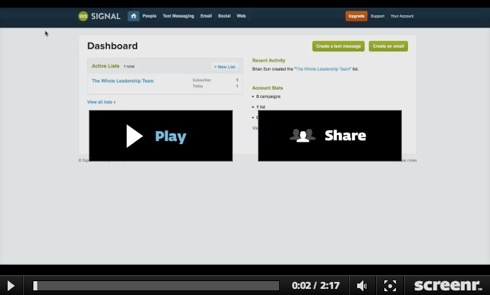 If you don’t like screencasts, here’s the written out instructions on how to create an account in Signal. 1. Visit signalhq.com in any web browser. 3. Click on the link that says “free plan” – it’s underneath the table in tiny blue print. Signal is free for up to 500 subscribers. 4. Fill out the form with the required information. 6. Check your email for one titled, “Activate your Signal account,” open it. 7. Click on the really long link. 8. Fill out the form with the required information on the page it takes you to. 9. Click on the green button that says “Save and Get Started!” You’ve made an account. Good work! How To Create A List And Keyword In Signal. Right after you sign up, you’ll want to set up your first ‘keyword,’ which is the word people text to Signal to sign up for your texting group. Here’s how. If you don’t like screencasts, here’s the written out instructions on how to create a list and keyword in Signal. 1. Name your list – this is for your reference only, it won’t be seen publicly. Possible examples include: Cru Large Group, Small Group Leaders, The Whole Leadership Team, etc. 2. Click on the box next to “via text message” to let Signal know how you’ll be communicating with your list. 4. Write a number in the form and choose a frequency (weekly, monthly, etc) that tells how many and how often you’ll be sending texts to your list. A rough estimate is fine. 5. Click the green button that says “Create” and you’re done. Good work! How To Send A Text Message In Signal. Sending your first text message comes after students have texted the keyword to the shortcode number. At your leadership team meetings, big group gatherings, and other applicable meetings, have your students text the keyword to the short code number – that’s how they become subscribers. Once you get subscribers, it’s time to send your first text message. Here’s how. If you don’t like screencasts, here’s the written out instructions on how to send a text message in Signal. 1. Click on the button that says “Create a text message” — it’s in the top right hand corner of your dashboard. 2. Name your message in the text box that says “Name this message” — people you text will not see the name of your message, it’s for your reference only. 4. Include “Msg&data rates may apply. Text STOP YOURKEYWORD 2quit” at the end of every text message you send out. It’s a legal thing. How to schedule your message for the future: After you click on the little circle directly to the left of the phrase “In the future” then click on the little calendar directly to the right of the text box where you see the date and time of when the message is currently sent to be scheduled. The calendar will open. Choose the date and time you want the message to be scheduled. That’s it. 7. Re-read your message (on the right is the draft of what your message will look like on a phone). Double check the date and time it’s scheduled to be sent out. If it’s the message you want to send at the date and time you want to send it, click the button that says “Approve.” If it’s not the message you want to send, or it’s scheduled for the wrong date and time, click the back button, make the essential changes, and go back to step six. 8. Celebrate! You’ve clicked the “Approve” button and your message is scheduled to be sent to your students. After signing up for Signal, you’re on your way to improving your communication with students on while they’re on the go. Happy texting. As of the writing of this article, if you visit Signal from your smartphone, you won’t see a link to login. Thankfully, you can get around that easily with a bit of trickery: Just visit http://app.signalhq.com/ (and bookmark it) on your phone, and you should be able to log in and use the service without any trouble. Thanks for the great writeup Brian! It appears that since the writing of this article the free plan got a lot smaller (100 texts per month and 100 subscribers). Are there any other better options now that the free plan changed? Here’s a post about choosing the best mass texting service for your ministry: http://www.staffhacker.com/524/finding-the-best-mass-texting-service-for-your-ministry — it includes links to other services to check out. Although Signal’s pricing plan has changed, I still recommend going with them or Tatango because of their usability, great customer service, and overall value they provide. GroupMe (http://groupme.com) is a free option that’s more of a chat service than a broadcast service. That might be something to look into as well. I just wanted to give you a heads up that since you put these videos together we’ve made a ton of changes – introduced a mobile optimized version of the app, introduced a new dashboard, added click through tracking, etc). We also pulled down the freemium pricing option since we didn’t see the paid customer conversion stats we were hoping for, but we still have an full featured trial option that people can use for 100 text messages per month and only pay $29/mo to upgrade to unlimited messaging (email too). I hope everything is going well for you and StaffHacker!